The UK’s national noise reduction charity, the Noise Abatement Society, presented the Airbus A380 with one of its top award at their annual award ceremony Tuesday night ... recognizing the aircraft for its reduced noise signature around airport communities. At a special event held at the House of Commons in London, the Society presented Airbus with the John Connell Silent Approach Award for the A380 and its innovations in quiet technology. Presented by Sir Bob Russell MP, the award recognizes local authorities, industry, organisations and individuals judged to have been outstanding in their efforts to reduce the impact of noise nuisance, or seeking to pioneer practical and innovative solutions to noise pollution and the enhancement and management of the soundscape. “The A380 has been in service with airlines for over five years and is the quietest long-haul aircraft for the foreseeable future - generating only half the noise on departure of some other large long haul aircraft and up to four times less noise on landing while carrying 40% more passengers," said John Roberts, Airbus in the UK A380 Chief Engineer. "The A380 is also recognized as having made a step change in passenger comfort by the huge reduction of noise levels within the cabin, making long haul flying a more enjoyable experience." Typically seating 525 passengers in three classes, the aircraft is capable of flying 8,500 nautical miles non-stop. 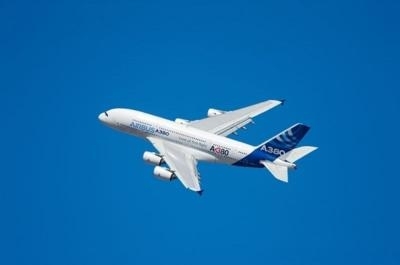 To date, Airbus has recorded 257 firm orders for the A380 from 20 customers.